The TEA TROLLEY is manufactured in stainless steel for easy cleaning and for its corrosion resistance. 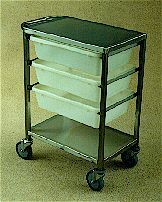 The top of the trolley is designed to fit a tea urn while leaving sufficient space to carry extra items. It has 3 plastic crates 140mm deep to take cups, saucers and cutlery and there is also space at the bottom for an extra crate or other equipment. Additional crates (XE/228 No. 5 PLASTIC CRATE) can be supplied. The trolley is fitted with 125mm castors (2 fixed, 2 swivel). 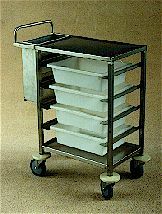 The cafe trolley is designed to assist in clearing tables in cafes, cafeterias and restaurants and is supplied with 5 plastic crates or can be used to hold 5 trays up to 520x390mm. It has a stainless steel top which can be used as a work area or to take a container for collecting crockery and cutlery. There is also a removable bin at the rear. It is fitted with 125mm castors (2 fixed, 2 swivel) and 125mm round buffers to the corners.